with an electronic chip that enables immigration officials to authenticate a traveller’s identity digitally. Home Affairs Deputy Minister Cde Ziyambi Ziyambi told The Sunday Mail last week that a new satellite system linking Harare to many other parts of the country now enables the department to process documents such as birth certificates, passports, marriage certificates, death certificates and national identity cards at the point of application. Cde Ziyambi said the department would also soon take delivery of a passport printing machine that will cut costs significantly. 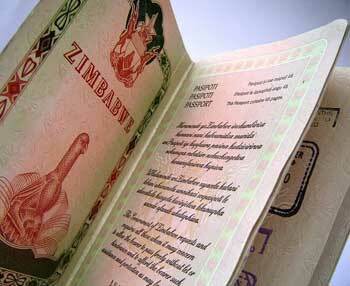 At present passports are printed externally, leading authorities to pass on the resultant high expenses to applicants. “Some of our districts are connected via satellite. So, we are hoping all our districts will be connected in the short term. The central server is in Harare. This means if someone is processing, say, a passport in Chinhoyi the information will be available if you enter the applicant’s name into the system. Cde Ziyambi said manual work and paper-related processes at the RG’s Office in Harare will be phased out at the beginning of next year. “There is going to be less and less paperwork. We are moving towards a scenario where everything will be computerised. For example, we will no longer ask people to bring passport-size photographs. He said passport application fees were high compared to those charged in other regional countries. The deputy minister said the purchase of a new printer would translate into reduced costs to both the department and applicants. “The passport fees have not been in our hands because the booklet is printed elsewhere. We are not determining the fees; the printers of the travel documents are. Therefore, we are looking at modalities of bringing a new machine to the department. “Admittedly, the cost of our passports has been on the high side as we compare to other fees within the region. However, the efforts we are making will drastically reduce the costs. We should have all the necessary equipment at the beginning of next year. Naturally, the cost will go down if you produce something on your own.